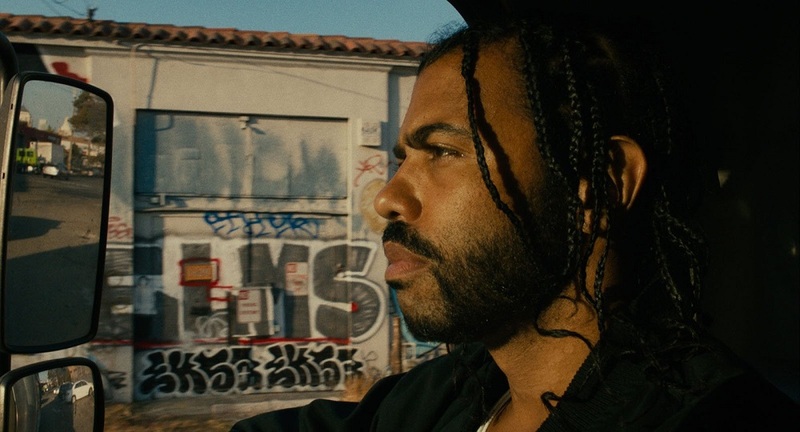 Oakland native Collin (Daveed Diggs) has three days left on his probation. He’s been working a job as a professional mover with his best friend Miles (Rafael Casal) for a company that just so happens to be run by his ex-girlfriend Val (Janina Gavankar). She’s no longer angry about the antics he pulled to land himself in jail, but she still is disappointed in Collin, and even if she trusts him to always do a good job the chances she’ll ever be able to forgive him for his past violent mistakes are highly unlikely. Maybe things will change at the end of these three days. Maybe they won’t. Either way, Collin intends to walk the straight and narrow from this point forward, especially for the next 72 hours. But just before midnight the mover inadvertently sees something that puts his whole life and the choices he’s made in an entirely new perspective. At a secluded intersection Collin is a terrified witness to a police shooting, a lone White officer gunning down a Black suspect square in the back. 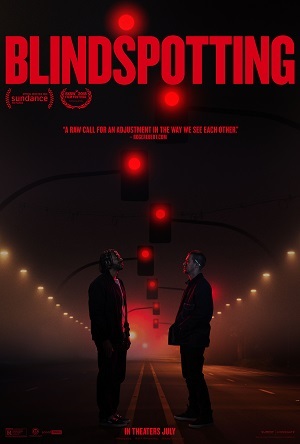 Blindspotting is a tough movie to talk about other than to say it’s spectacular and I can’t wait to watch it again. Please note, that’s coming from someone who’s already seen it three times, each viewing allowing me to notice even more deft nuances and politically vicious insights than I did the time before. Written by Diggs and Casal, the former a vaunted Broadway star and a best-selling rapper, the latter a spoken-word artist, educator and playwright, the film is born out of the pair’s well-worn friendship born in Bay Area neighborhoods and nurtured as teenagers while attending Berkeley High School. This is a story that is fresh, funny and vital, the electrifying observational meditations at its center overflowing with a satirical edge that’s frequently thrilling. 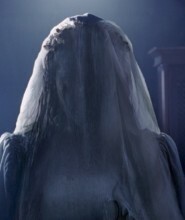 I loved this movie. Full stop. And no matter what I say next that’s the key statement that matters most. Diggs and Casal have a lot on their minds, and not just on topics pertaining to racial inequality and police brutality. The pair riff on the gentrification of the inner cities thanks to the rise of giant tech conglomerates like Facebook and Amazon, gun violence, blended families and cultural appropriation. They balance humor and drama in ways that are less than subtle, getting right up in the viewer’s face as they put the hammer down on these hot button issues with cravenly incisive rage. At the same time, they also craft a pair of complicated, three-dimensional characters who make a number of questionable decisions as they attempt to navigate the final three days of Collin’s probation, Val frequently the voice of reason who must remind her former boyfriend what initially got him in trouble and what he now needs to do in order not to find himself in a similar situation over again. 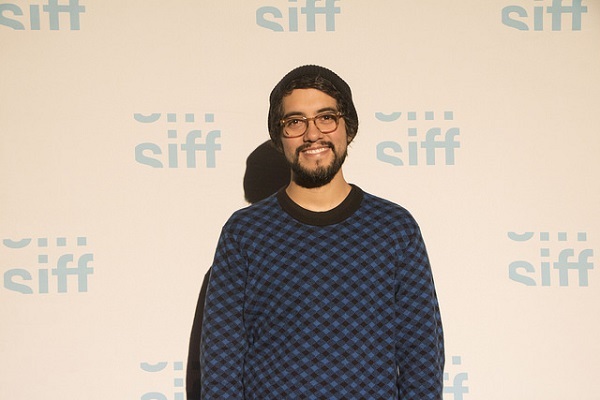 Newcomer Carlos López Estrada directs with fluid confidence, allowing comedy, drama, satire, suspense and outright terror to all coexist in a naturalistically humanist way that’s wonderful. There’s a spellbinding moment where a random nobody recognizes Collin and proceeds to tell a friend a story about an incident he happened to witness at a local nightclub. The way he recollects things, this is a spectacularly funny incident, one where a drunk patron’s stupidity led to him getting what he felt were the guy’s just deserts. But to Collin and especially Val, this is one story neither would like to be reminded of, the level of disappointment, regret and outright sadness filling both of their faces as this clueless guy standing in the moving company’s lobby continues to flippantly tell his tale shattering my heart to pieces as the scene built to its crescendo. While not as imaginatively original as Boots Riley’s Sorry to Bother You, Estrada, Diggs and Casal have still put together a motion picture that’s far more consistent and free of any dead spots. This film burns up the screen for every one of its lightning fast 95 minutes, things climaxing with a bit of razor-sharp lyrical poeticism that had me sitting on the edge of my seat wondering what was going to happen. Diggs delivers a sensational performance, one of the best I’ve seen this year, while Casal, Gavankar and a dead-eyed Ethan Embry, whose character I’m purposefully saying precious little about, add magnificent support throughout. 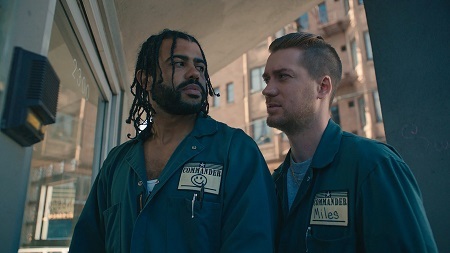 As I stated earlier in this review, I love Blindspotting. It’s the kind of film I want to stand up and cheer the moment the end credits come up on the screen, the type of nail-biting human drama I wish studios made more of and the kind of incisive, take-no-prisoners satire viewers of all persuasions owe it to themselves to take a chance on and see. In short, this is one incredible piece of pop, character-driven madness where social commentary and entertainment value are blissfully one in the same.